Sludges must first be dewatered before it can be utilized in the environment. 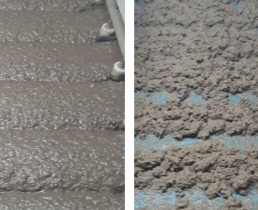 Continuous and efficient polymer dosing control to optimize sludge dewatering is critical in order to enable efficient operation of wastewater filter belt presses. Currently, there are no measurement techniques available for in-line rheometry for continuous and efficient polymer dosing control to optimize sludge dewatering. The in-line rheology system was custom designed for a wastewater sludge dewatering application. The instrument is capable of measuring variation in rheological parameters of poly-dosed inflow sludge as a function of process parameters. This technology can now be used for improving the efficiency of wastewater plants by reducing the amount of chemicals/polymers dosage and thereby reducing operating costs. A unique relationship between process parameters, yield stress in the pipeline just after dosing and the filtrate suspended solids concentration (TSS) was established. Here the optimum operating condition was set to TSS 1 g/l, which means the in-line yield stress must be less than 5 Pa. 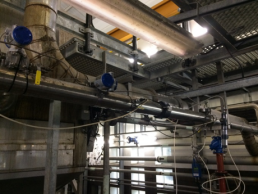 The Incipientus in-line rheology system was successfully installed in an integrated and operational WasteWater Treatment Plant (WWTP) environment. Improve the dewatering control system. Test variation in sludge rheology over time. Reduce chemical usage and operating costs. Link important process parameters to in-line rheology measurements.